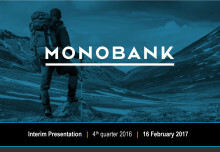 Monobank had a strong and eventful fourth quarter. Lending growth exceeded expectations and net profit increased. 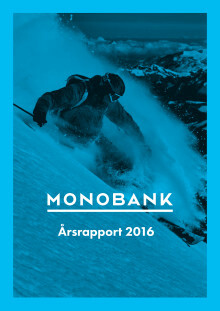 The bank successfully completed an equity issue of NOK 178 million. The strategically important projects, launch in Finland and credit card launch with Widerøes Flyveselskap and SAS EuroBonus, have commenced. In combination with a continued strong business momentum, Monobank is set for continued positive development through 2017. Fourth quarter net interest income was NOK 22.7 million and the net interest margin was 7.58 per cent. Operating costs were NOK 15.8 million, an increase of NOK 6.0 million mainly due to provision for employee bonuses and salaries. Net total loans amounted to NOK 840 million excluding prepaid agency commissions and unspecified loss provisions, an average increase of 35 per cent compared to third quarter 2016. This is ahead of plan. The credit quality remains in line with projections. Per year end 2017, Monobank expects net loans in the Norwegian market to be in the range NOK 1.7-1.8 billion. Deposits from customers amounted to NOK 903 million. Per year end bank deposits and holdings liquid securities were NOK 352 million and total equity amounted to NOK 331 million. Loan provisions amounted to 4.2 per cent of loans in the quarter, and gross loans in default since the bank commenced regular banking operations was 3 per cent of average gross lending. Monobank will continue to evaluate other business opportunities that may complement or enhance the bank’s core product. This is of particular significance as the industry continues to innovate in the interface with consumers. “We´re pleased that we have succeeded in establishing a solid base for further growth throughout 2016. Looking ahead, we expect an increased growth pace and we are confident that our launched strategic initiatives will take us to our ambitious targets. Digital banking with automated solutions are the core of Monobank´s strategy, and we believe our solutions provides us with a competitive edge that we are eager to utilize both in our domestic market and abroad”, said Bent H. Gjendem, Chief Executive Officer at Monobank. As of today Monobank will be listed at Oslo Stock Exchange Merkur Markets and the Monobank share will be traded with the ticker code MONO-ME.